There are a lot of human silhouette targets on the market and many of them share the same issues. They are larger than will fit in any reasonable range bag or than can be printed at home and they offer unrealistic target indicators to the shooter. Ivan at Kit Badger has set out to create a target, the Kit Badger Anatomy Target (KBAT), to address these issues. If you shoot anywhere other than an improved range with comfortable parking and easy access, you know the pain of hauling all your gear to your shooting spot. If an item doesn’t fit in a range bag that can mean it has to be carried outside the pack or worse – it requires an extra trip. Large targets that must be rolled are just another item to carry and you will likely never be able to print them yourself. 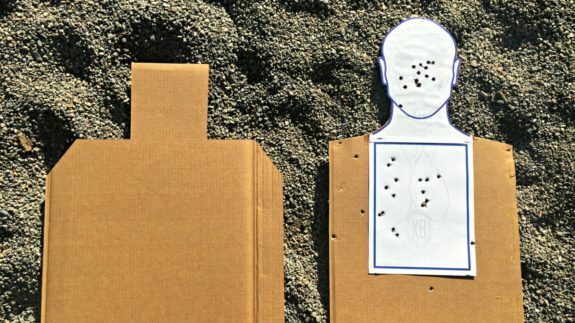 Even if getting your gear to the range isn’t an issue for you, the issue of unrealistic target indicators applies to most targets. The proportions and the very presence of things like scoring zones can skew the perception of the shooter. 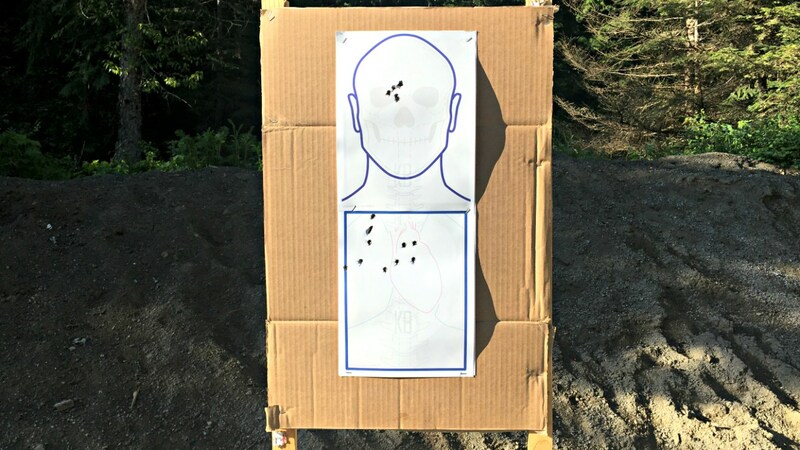 Anatomy doesn’t mimic the scoring zones on most targets and real people don’t have scoring zones tattooed on their bodies. The only real markers we have are things like ears, eyes, the nose, and the relative positions of anatomy in relation to the overall shape and orientation of the body. I’ve been fortunate enough to have access to the KBATs for a while now and they do a good job of addressing the issues above. The target is actually a pair of targets that can be used together to create a representation of all of the vital human anatomy or separately as a head and chest target depending on the shooter’s needs. The KBATs can be printed on standard 8.5 x 11″ paper on your printer at home. They can then be applied to any backer or you can cut your own and trim it to the bold target lines. You probably have room in your range bad to store a whole stack of them. All of the vital anatomy rendered in very light lines which makes them difficult to target specifically. The outline of the human form is rendered in heavier, bold lines so that the shape of the body and items like ears are really the only target indicators you have to work with. These various underlying anatomical elements are also rendered in realistic proportions so the brain stem area for instance, is rendered in its realistic size and location which is actually a bit lower than they way most of us train to target this area. If you want to color in other indicators like eyes or the nose, you can easily add it with a marker based on the underlying anatomy. 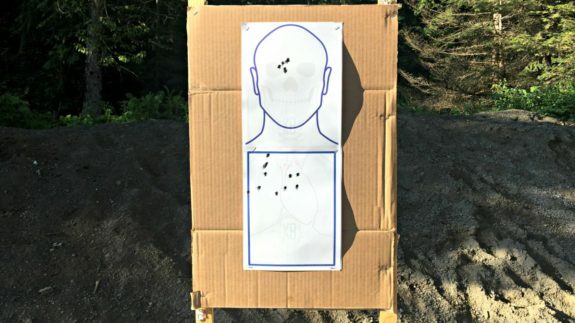 Soon, they will be available as a printed pad of targets that will offer the shooter even more utility (and a great price compared to many targets on the market). Stay tuned for more details on this. I strongly suggest you read Kit Badger’s site and view the video so you can get the most out of this free resource. There are a number of ways these can be used and modified to suite your needs.